y'all remember when i was pregnant with layla, how i took a picture every week with the baby bump and me holding whatever item of produce babycenter compared her size to at that point? i documented them all, the good, the bad, the pale and the bloated, under the tag, "weekly belly." click to enlarge and explore....if you dare and at your own risk. you may need to bleach your eyeballs after examining the whitey poochburger. i managed get almost every week (i missed week 8-kidney bean due to losing my brain over morning sickness, 10 & 11 shared a strawberry because i couldnt find a fig and a kumquat, and on 17 publix had no turnips). week 40 (pumpkin) we took ON layla's birthday right before we left for the hospital, 5 hours before she was born. it was our super soggy, molding and about to collapse jack-o-lantern that i would only touch with a towel underneath. for the most part, i would buy the fruit or veggie and take the picture from the comfort of my own home. but some weeks layla happened to be the same size as a vile or expensive item that i had no desire to purchase or consume. granted the only thing i really had a desire to consume during that pregnancy was captain d's and krystal (and yall best believe i got DOWN on that junk weekly). but on the weeks when i needed to get the picture, i would just borrow the item from the produce section and take it off to the typically-deserted greeting card aisle and do the picture there before returning the item to its place. this led to some SERIOUS embarrassment. i got busted a few times and felt like a total weird creepster. 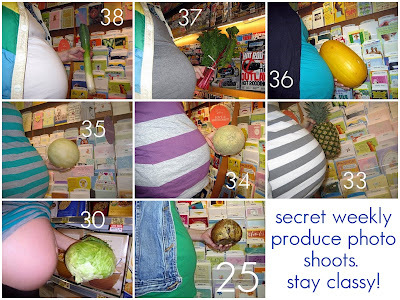 i mean imagine coming up that scene unawares: a pregnant lady taking a self portrait of her burgeoning belly and a random item of produce. the worst was when i took leave of my senses and lifted up my shirt for the week 30. a stock boy came around the corner when i was taking that pic. i'm sure it looked like i was rubbing their merchandise all over my stomach while photographing it like some strange deviant with a produce-fixation. i usually go grocery shopping on my way home from work on thursdays. i never have the kids because i use coupons and a list and managing all of that together does not work for me (kudos to moms who can wrangle it all...teach me your ways!). i didnt go last week so we were in dire need of some essentials yesterday evening. i left from home and took miss layla. she got her first ever cookie (free! i heart publix) and munched happily on it the entire time. as i was getting raisins, i realized i was in my belly's old stomping creeping grounds with the greeting cards behind us. i was laughing to myself remembering that huge belly that i no longer have and me all alone taking self-portraits of it. i told layla, "oh you have no idea how nerdy mommy was in this aisle." and then it freaking hit me: she was there all those times. layla is in every single one of those pictures! i mean, duh, i knew a baby girl named layla was in my belly the entire time i was pregnant, but we had no clue who layla actually was. now, we have this 10.5 month old that has a personality full to bursting and a life of her own, who we know SO well, so to go back and realize all of that energy and sweetness and uniqueness was there, in her tiny DNA and soul, packed in a smaller version inside my stomach is such a mind job (yes i have had this same mind job before). that my little big-bellied, fuzzy-headed, fraggle rock baby of joy was once a tiny poppy seed is insane and miraculous to me (and a little scary...please dont shrink!). naturally i had to take another pic. 40 weeks in and 46 weeks out...here we are again. the picture may be blurry, she's not smiling and has crumbs all over herself, and i am rocking a sports bra uniboob, but doy, this is my favorite of all the weekly belly pics. layla beats a crenshaw melon any day of the week. oh , but i like this girl. I've started taking belly shots... and I'm looking at you and your beautiful body and I can't imagine ever lifting my shirt up for one of those weekly shots. No. way. You're amazing. This was a really great post! I really thought you were announcing that you were preggers again and would be "back in the card aisle"...I skipped forward and had to go back and reread :). @joanna, you are high on prenatals, girl! you better show off that crossfit bod! @sarah M - i got the scared-y stomach swoops just from reading what you thought. no babies for a WHILE will be coming out of me. but i totally would have thought the same thing!